! Global Chat. Broadcasts a message to everyone on the server. ~ Ally Chat. Broadcasts a message to all your townmates on the same server. ^ or @ Global guild chat. Sends a message to all guild members. $ Party Chat. Sends a message to all party members. 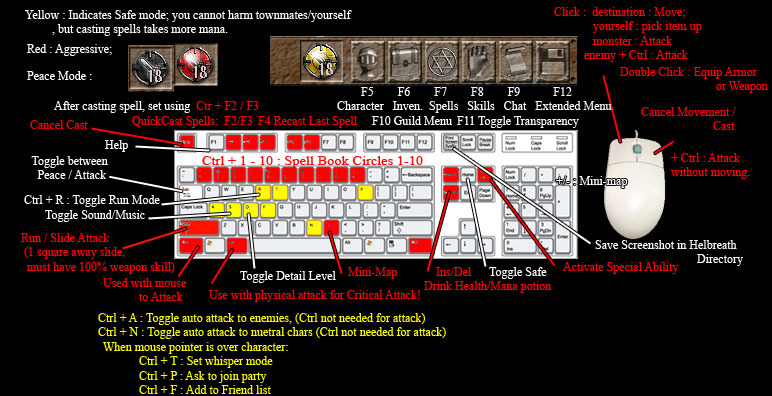 F2 Quick slot, press control and F2 to set after casting a spell or equipping an item or weapon. F3 Quick slot, press control and F2 to set after casting a spell or equipping an item or weapon. F4 Quick cast, recasts your last cast spell. F5 Opens your character’s statistics screen. F8 Opens your skills. At any given time you can have no more than 700% skill points. Clicking on the up arrow and changing the arrow to be down will prevent your character from loosing a skill point. F9 Opens the chat history screen. F11 Toggles transparency on most windows. Tab Changes the character from peace to attack mode. Home Toggles the safe mode, disabling the ability to hit people of the same town. End Repeats your last typed chat message. Print Screen Creates a screen shot, saved in your Helbreath game directory. Left Mouse Attacks an enemy monster, must be in attack mode. Control + N Enables auto attack on friendly and neutral players and monsters. Must be disabled when talking to NPC’s. Also allows you to mine and farm with out having to hold down the control button. Control + A Ability to auto attack enemy players. Control + M Shows or hides the mini map. + and – Zooms in or out on the mini map. /to Name Toggles private a private chat between you and the name, case sensitive. /to Breaks whisper mode. You can also start the chat line with #Text, if you want to remain in whisper mode, but talk with those around you. Control + S Toggles Music and Sound off. Shift + Control + Left Mouse When at 100% weapon skill, you can dash attack. Alt + Left Mouse When at 100% weapon skill, you can do a critical attack. Control R Toggles auto run. Shift Allows you to run when you press the shift button. Alt + F4 Begins the logout process. Damage cancels the count down. /rep+ Name Gives a positive evaluation to another player adding to their reputation count. /rep- Name Gives a negative evaluation to another player, reducing their reputation count. /hold When you have summoned monsters whether they have been created by a spell, potion, crusade monsters (Guild Masters only) or during a Siege you can make the monsters stand in place while you can move around with out them following. /tgt Name Targets a person (enemy only) forcing the summoned monsters to find and attack them. /free Sets your summoned monsters free and allows them to follow their master again. /fi Allows you to find out whether or not a person is online. Will only let you know if the person is connected. No message will be returned if they are not online or if you’ve spelt it wrong. /setpf Lets you set a personal message that can be seen if some one /pfs you. /pf Name Lets you know if a person is on the same map as you. Their personal message will appear. /ekscreenshot Toggles screenshot upon enemy kill (EK) on and off.